WCPE’s Music Director William Woltz announces the station’s seasonal music offerings for December 17, 2017 through January 1, 2018. 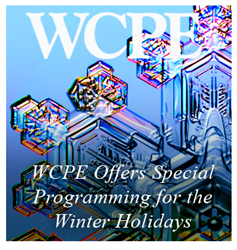 WCPE is pleased to offer unique programs of holiday music. “WCPE is pleased to offer unique programs of holiday music,” says Woltz. "Lullabies and Carols for Christmas" is a program of beautiful and relaxing songs for the season presented by Rob Kennedy, host of WCPE's Great Sacred Music every Sunday morning. Rob has chosen a mix of favorite songs with some added surprises to make for a delightful hour of music. Friday, December 22 - 11 a.m.
Saturday, December 23 - 6 a.m.
Sunday, December 24 - 5 a.m.
Monday, December 25 - 3 a.m.
Sunday December 24 at 7:00 p.m.
Bob Chapman, host of WCPE Opera House, presents three hours of favorite Christmas works by the stars of the opera stage. We survey the best new Classical CD releases of 2017 in a special year-end edition of Preview beginning at 6:00 p.m. Stay tuned from 9:00 until midnight for a feast of Viennese waltzes and other festive favorites to help you ring in the new year. You can request your seasonal favorites on All Request Friday December 29, 2017 and the Saturday Evening Request Program December 30 here. The Great Classical Music, 24 Hours A Day offered by WCPE transcends belief systems, being crafted by artists from all traditions and listened to by a global audience reflective of the world’s diversity. Found throughout WCPE’s programming are the traditions of people from all walks of life. WCPE’s live broadcast of Great Classical Music, 24 Hours A Day can be accessed around the globe in several ways; on-line streaming in multiple formats, including IPv6, local cable television systems and traditional radio broadcasting. A complete list of the ways WCPE is available with instructions for cable and satellite reception can be found at theclassicalstation.org/listen.shtml. In central North Carolina and southern Virginia, WCPE is found on the radio at 89.7 FM. Since 1978 WCPE 89.7 FM has been dedicated to excellence in Great Classical Music broadcasting. WCPE is one of the first community-supported stations to stream on the Internet. The programming is available on our own satellite channel and on multiple Internet streams, including IPv6. WCPE receives no tax-derived support, rather depends on tax-deductible support through on-air fundraising and mail-out campaigns. More information can be found at http://www.TheClassicalStation.org or by calling 919-556-5178.